Gun violence in the United States is much broader than the mass shootings that make headlines and grab public attention, says the Rev. Michael McBride. 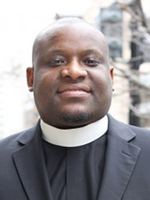 Those shootings, primarily focused in urban areas, are “disproportionately visited upon the bodies and the souls of dark-skinned people,” the legacy of a long history of racism and violence, said McBride, the national director of the Lifelines to Healing/LIVE FREE Campaign, a faith-based effort to address gun violence and mass incarceration of young people of color. The church has a critical role to play in the effort to address gun violence -- helping to create peaceful communities, he said. McBride -- known as “Pastor Mike” -- is a native of San Francisco and has been in ministry for more than 20 years. A graduate of Duke Divinity School, he planted The Way Christian Center in Berkeley, California, where he serves as lead pastor. He and his brother, Ben McBride, were featured speakers last fall at the God and Guns conference at The Riverside Church in New York. He spoke recently with Faith & Leadership about gun violence, race and the church. The following is an edited transcript. Q: You and your brother, Ben McBride, spoke about the intersection of race and gun violence at the God and Guns conference last fall. Where and how do those two subjects meet? Gun violence in this country is disproportionately visited upon the bodies and the souls of dark-skinned people. So our work is to recover and understand that historical legacy of violence. Otherwise, we become ahistorical about how violence has been visited upon the colonized, and we create the conditions whereby trauma and violence continue to be visited upon members of our community. We have to hold all of that together -- the historical reality of violence upon the bodies, the souls and the communities of dark-skinned folks -- if we’re going to have a peaceful and sustainable community. Q: What do you mean when you talk about “gun violence”? What we tend to hear about are the mass shootings, like at the Pulse nightclub in Orlando or, a few weeks ago, at the Orlando airport. Every day, the number of individuals killed in this country by guns equals a mass shooting. We have a school bus’s worth of gun violence victims every day -- 33, 34 a day. They are disproportionately black males. We have a country with a gun violence epidemic. When you look at race and violence across the world, two things seem to be different about our country: the availability of guns without any meaningful regulations and the legacies of slavery and structural racism. When we talk about gun violence, particularly in urban communities, it’s important to have both a historical and a contemporary analysis. Every day, mass shootings happen in urban communities that never get reported, that never move this country to address the laws and the culture that make these violent deaths possible. Those of us who are followers of Jesus, who serve in ministry, particularly in neighborhoods where these violent acts happen, are responsible to be the trumpets and sound the clarion call for peaceful communities. Q: As the (London) Guardian recently reported, gun violence in the United States does not occur uniformly across the country but is highly localized. Speak some to that. Absolutely. Only 70 cities in this country have more than 25 gun-related murders per year. And in those 70 cities, the data tells us that less than 0.5 percent of the city’s population is responsible for almost 60 to 70 percent of the gun-related shootings and homicides. We have 19,000 cities in the United States, so most gun violence occurs in only a small number of cities. And even within those cities, it’s a small number of gun offenders who are causing a disproportionate amount of pain and injury, and even their own demise. So how do we reach that 0.5 percent of individuals who are driving the overwhelming majority of this violence? When interventions are grounded in love, care, opportunity and healing -- with consequences for those who continue to engage in destructive behaviors -- powerful transformation and change happens, and folks actually stop engaging in that kind of violence. The challenge is to address the local manifestations of the problem, realizing that it does not require racial profiling, aggressive policing, mass incarceration and other over-policing remedies. They are not necessary, because the perpetrators, and the victims, are all so focused and narrowly networked that we can intervene with them with strategic and targeted approaches. Q: Historically, what you just described -- aggressive policing and punishment -- has always been our country’s response, has it not? Yes. And this is where the intersection of race and gun violence becomes so pernicious. There’s a wonderful book, “The Condemnation of Blackness,” by Khalil Gibran Muhammad, that I referenced in our Gods and Guns event. He talks about how sociologists at the turn of the 20th century connected crime and violence with blackness. It became a sociological and then a criminological point of fact that blackness equaled criminality, and that began to shape public policy. The bodies of black folk needed to be policed in the public spaces. They had to be corralled and controlled. And then public policy on housing, schools and employment played that kind of role for literally the last hundred years. The Black Lives Matter movement and other movements over the last hundred years have always been a response first against policing, because that is the tip of the spear of controlling the bodies of black people in public spaces. And every era where these kinds of policies were promulgated, theology and religious categories were used to undergird and explain why such steps were necessary. Theology, biology, sociology, economics have all been used to explain to the public why racialized policing, incarceration, housing, on and on and on, was needed. So part of our work as faith leaders is to disciple our people away from racial hierarchy and the criminalization of black and brown and poor bodies. We have to have a theology of the body that recovers the beauty of every person regardless of race, gender, class or sexual orientation. And then move from there to creating communities where peace -- not just the absence of violence but true peace, justice and inclusion -- becomes the natural result of our theology, preaching and discipleship. The American church has a lot to repent of, and we have a lot of work to do to create that kind of constructive and positive theology and discipleship. Q: What does the church need to be doing? The church needs to take this moment of Donald Trump’s election as a clarion call for us to lead into difference. Seventy-five percent of the country of voting age did not vote for Donald Trump. Roughly half of eligible voters stayed home, another 25 percent voted for Donald Trump, and 25 percent did not vote for Donald Trump. The vote broke along race and class lines and religious lines. Portions of this country would love to pit us against one another. The church has to be the vanguard of carving out a new identity that includes all people and allows the suffering of one to be the suffering of the other. We have to share more spaces and have more conversations. Churches have to develop a peace theology of resistance to the empire that is built on violence, force, death and exploitation. Our primary call is one of discipleship, one of not necessarily reconciliation but of conciliation -- a coming together around who we are called to be as God’s people. We need to preach, pray and act. We have to preach liberative messages, we have to pray both in word and in deed, and we have to act, standing with and for the victims of violence and even the perpetrators of violence. Q: How do you turn people from reflexively responding to gun violence with longer sentences, more policing and such? What are the hard conversations we need to be having? Certainly, one conversation we need to have is around race and difference and racial hierarchy. We have to resist our unconscious and conscious anxieties that are grounded in race and in the other. Second, we have to commit more time in the streets, outside the four walls of our churches, and meet our neighbors, and meet both the victims and the perpetrators of violence. If we don’t know them and their story, their hurts and their pains, if we don’t know that they were victims of violence before they became perpetrators of violence, then of course our initial reaction will be to lock them all up and throw away the key. But if we can appreciate that trauma is there and that hurting people hurt other people, then maybe, rather than seeking retribution, we can have a hard conversation about healing and restoration. Those are deeply biblical and theological concepts that the church is uniquely poised to provide. And third, our churches, denominations and institutions need to think about a radical investment of dollars in peacemaking in these urban neighborhoods and communities. We should imagine an investment of dollars to scale up prevention and peacemaking activities so we can end gun violence. That would be a unique investment by our white and affluent mainstream congregations. What would it be like to partner with an urban church or an urban peacemaking organization and provide incentives for the young men -- and increasingly, women -- who are caught in these cycles of violence to cease from their activities and get healing, education, housing and food? These examples are within our reach today. The question is not about our skills but about our will. Do we love the bodies, the lives, the communities of black, brown, poor folk enough to invest in their lives? Or are we always going to look toward sending foreign aid -- to families and people we may never meet -- and ignore those that we are living around every day? Q: What programs have worked in reducing urban gun violence? I understand that you have been involved with some programs in California such as Operation Ceasefire. There are several interventions and strategies to reduce group violence that have been implemented in California. Because 0.5 percent of any given city’s population is driving 60 percent of the violence, we structure interventions for that 0.5 percent. One such intervention is a “call-in.” That’s when we identify firearm offenders and bring them into a conversation with community members, faith leaders, nurses, victims, survivors and police officers, telling them that they are loved and that we want them to be a part of the community but they have to stop engaging in violence. And if they stop engaging in violence, then we will offer them resources and opportunities for healing, for jobs and, if necessary, relocation. But if they do not, then the full weight of the justice system will be focused on them. We find that 50 percent of those who come into the call-in stop committing violent crimes, just because someone engaged them and offered them an alternative. Another strategy is a peacemaker strategy, or peacemaker fellowship. In this approach, active firearm offenders are identified and placed in a 12-month fellowship where they develop friendships and relationships with individuals, often the people on the streets they are in conflict with. We tell them that at the third or fourth month, we’ll begin to provide a living stipend tied to certain benchmarks -- create a life plan, go to therapy, participate in group sessions. You have to stop shooting and engaging in lethal violence. We will eventually take trips with you beyond your own block, and visit other states. We find an almost 90 percent success rate in those kinds of fellowships. We have found that what we call “the cost for peace” is usually as low as $20,000. Meaning that if we provide as little as $20,000 in incentives or income for these active firearm offenders, we can usually get them to disengage from violence and be redirected onto a trajectory that leads to being a viable, giving part of the community. The Rand Corporation and the Centers for Disease Control estimate that every gun-related homicide costs the taxpayer $2 million. We’re starting to make this argument -- not with a lot of success, but we hope that it starts to have traction -- that it is cheaper, literally, to incentivize, resource and sometimes even pay gun offenders not to engage in gun violence than it is to pay police officers to try to prevent it. It’s a radical rethinking about how we resource public safety in our communities. Q: And these are programs that you’re familiar with through your work as director of the Lifelines to Healing/LIVE FREE Campaign with the PICO National Network? Yes. It’s really a learning community that’s open to whoever wants to join. Another program is to have outreach workers or violence interrupters -- mostly, formerly incarcerated individuals. They are paid by nonprofits and/or public health departments to show up in hot spots and do mediation and case management of active firearm offenders. They go and they help create peace. We have found that, over 18 months, those three strategies can reduce gun violence by as much as 60 or 70 percent. These initiatives are largely funded by philanthropy and donors. We’re trying to have a radical reorientation around how we invest in these strategies that work, saving us lives and money and helping us build peaceful communities. That’s one thing that our churches, pastors, faith leaders need to be champions of. Q: How did addressing gun violence become part of your ministry? I have spent my whole life in urban neighborhoods. As a young person, I went to funerals for a number of friends lost to violence. I’ve always considered my making it out of these neighborhoods an act of grace given by God and a testimony to my parents. But it also left a calling to come back and do all I can to make sure this reality is not visited upon the children of my friends and loved ones. When I became a pastor, I buried a number of teenagers who were members of my church. I remember one funeral, we had about 500 young people, and I asked how many had been to one funeral. All of them raised their hands. I got up to about five funerals; all the hands were still up. I got as high as 10 funerals, and half of the young people still had their hands up, weeping. That just so moved me. It was not enough for me to preach a message of life from the pulpit. I had to actually get out into the neighborhoods and create the conditions for life for the young people that lived in our communities. Doing funerals for teenagers and young adults forces you to do more than preach. That’s why I do this work. It flows out of my love for God, my love and my call to ministry, and my love for our people who are often leaving this earth way too young and way too soon. Q: Do you get discouraged? Oh, of course I get discouraged. I’m human. But being discouraged does not give me the right to stop or to check out, because I’m also discouraged by the numbers of individuals who died needlessly to gun violence. Just because it’s difficult doesn’t mean it’s not necessary.